In 1916 Samuel Kamauela Kamaka decided to start his own ukulele business in the basement of his house in Kaimuki and selling them for $5 apiece. By 1921 he was able to hire employees and move out of his basement to a workshop. By the late 20s there were an estimated 15 ukulele manufacturers in Hawaii. 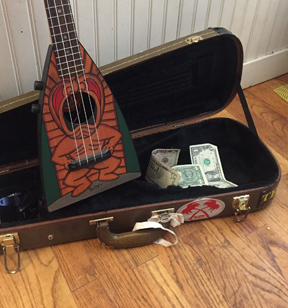 The competition was stiff, but a pineapple shaped ukulele designed by Sam Kamaka, Sr. in the early 1920's helped his company outlast his competitors and within a decade, Kamaka was the only Hawaiian ukulele maker left. In 1959, the same year Hawaii became a state, Kamaka Hawaii moved to their present location at 550 South Street in Honolulu where Sam Kamaka's sons, Sam Jr. and Fred, are managing operations. Today, Kamaka Hawaii, Inc. manufactures about 3,000 instruments per year and they have a backlog of over 12 months. The best place to buy Kamakas are right at the factory, at 550 South Street in Honolulu.